Our fleet of helicopters are used extensively throughout Tasmania and interstate as fire support with the Tasmania Fire Service, Parks and Wildlife Service, Forestry Tasmania and major forestry companies. We are able to undertake aerial fire bombing (bucket and belly tank up to 1,200 litres), fire surveys and reconnaissance, fire spotting and transfer of fire personnel. Our quick response to fires means we are able to promptly assist with controlling fires and protecting properties statewide. 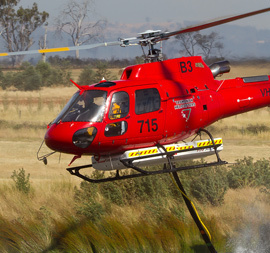 We have our own range of aerial fire fighting equipment and employ highly experienced ground support crew. Our latest helicopter (Eurocopter AS350 B3) is specifically for fire support in Tasmania, with an improved water carrying capacity of up to 1,100 litres. We are committed to protecting Tasmania in an aerial fire support role.